So you’ve decided to pay a visit to the Colosseum in Rome, now what? There’s more than one way to see this monumental amphitheater – it all depends on you! All our Colosseum tours include skip the line tickets and English-speaking local guides and access to restricted areas. However, they all feature different highlights. For example, some of our tours include the Underground and Arena Floor where gladiators once faced death. Read this article and watch the video below to figure out which Colosseum tours are best for you. Standing on the Arena Floor, let your eyes wander upwards and imagine 60,000 screaming spectators. If this sounds like it belongs on your bucket list, you’re in luck. In the 1990’s, a portion of the Arena Floor was reconstructed, making it easier for modern-day visitors to see what the Colosseum looked like in its heyday. This is where Roman gladiators and animals fought, sometimes to the death! Only a limited number of people with a special Arena Floor reservation are allowed to access this area, so it’s worth planning in advance. 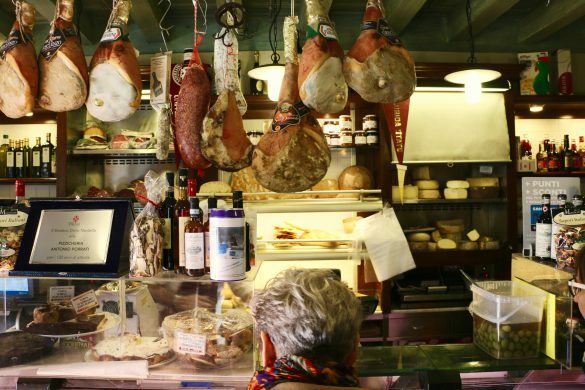 If you're traveling to Rome with kids or you're looking for cheap things to do in Rome, this tour is a good bet. Escape the crowds and walk through the special “Gate of Death”. This is where the losers would be dragged off the arena floor. Walk out onto the reconstructed arena floor, located in the heart of the Colosseum. Includes a skip the line guided visit to the Roman Forum. 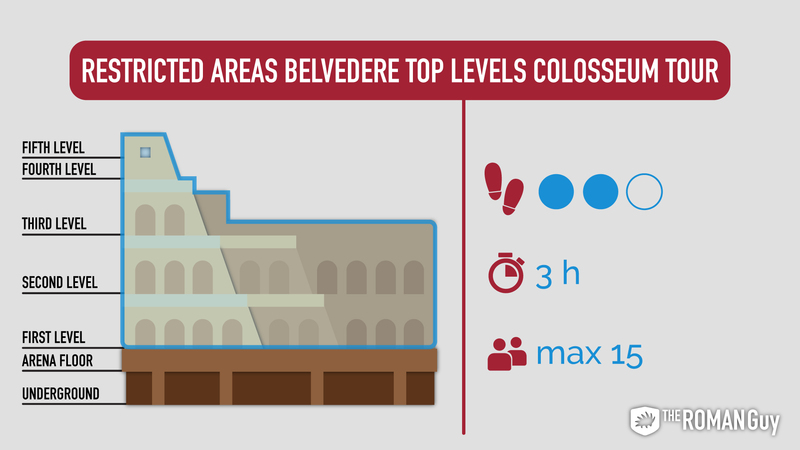 Belvedere means viewpoint or lookout in English, and yes, you guessed it, this tour goes all the way to the top of the Colosseum for some jaw-dropping views. This is one of the best Rome tours for you if you love to take photos. Gain exclusive access to the Roman Colosseum's restricted upper levels and unprecedented views down into the ancient amphitheater and Roman Forum. After four decades of closure, the opportunity to ascend to the top of the Colosseum is now available to a limited number of people. However, if you're scared of heights, this one probably isn’t for you. Sorry! Go behind a padlocked gate and up to the highest levels of the Colosseum, leaving the general public and regular tour groups behind you. 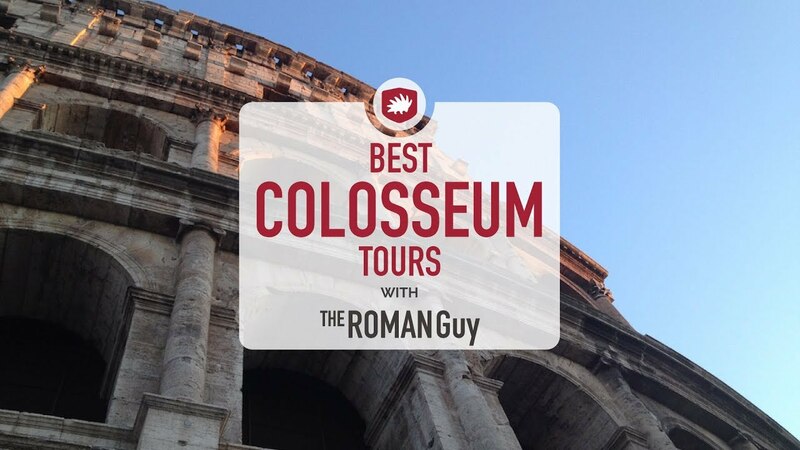 Also known as the Colosseum Dungeons tour, this is the hottest tour in Rome and a Colosseum bestseller. Due to extremely limited availability, this tour sells out within minutes of going live during the busy season. So, if you decide this one is for you, make sure you book well in advance. Not only do you gain exclusive access to the “Hypogeum” (dungeons/Underground), but you’ll also get the opportunity to walk out on the Arena Floor where the the gladiatorial matches took place. If there weren't enough, it also includes a guided skip the line visit to the Roman Forum. Instead of looking down into the Colosseum like you do on the Belvedere tour, you look up into the Colosseum from below. Trust us, it’s pretty amazing. 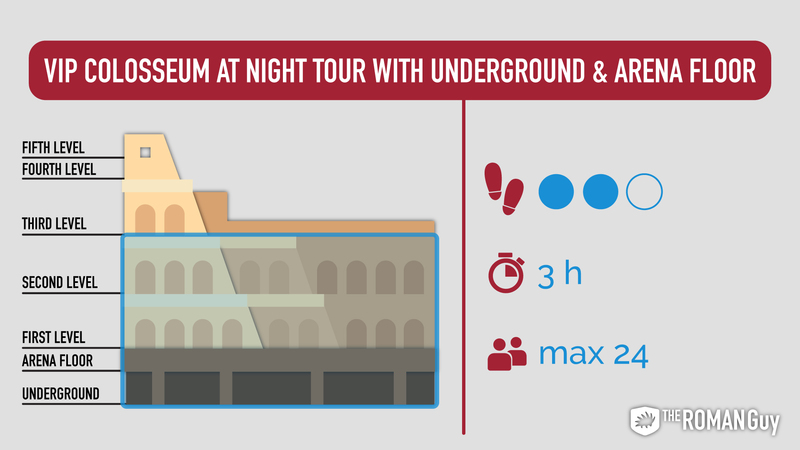 The Colosseum Underground tour is a behind-the-scenes full package kind of tour for people who want to feel like VIPs on vacation. Go underground and into the Colosseum’s dungeons, with an expert English-speaking guide. Walk out through the "Gate of Death" and out onto to the Arena Floor, where the brutal games took place. Includes a skip the line guided visit to the Roman Forum and Palatine Hill. Want an experience even more VIP than our daytime Underground tour? Well, you're in luck! Our Colosseum Night Tour is one of the most exclusive experiences you can get in Rome. Experience the Colosseum Arena Floor and Underground under moonlight with no crowds. That’s right, if you choose our VIP Colosseum at night tour, it’s quite possible that you won’t see a single other tour group while you’re inside the amphitheater. 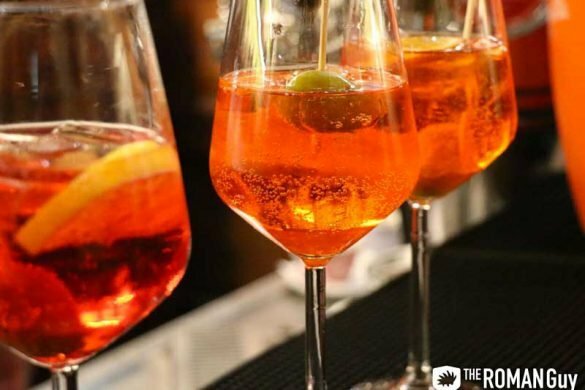 Think about that for a minute – this is as exclusive as you can get in Rome without spending thousands of dollars! Not only do you get to skip the crowds and heat, but there are other benefits if you tour the Colosseum at night. For one, you get access to the Underground and Arena Floor. You’ll also enjoy a warm-up section of the tour that takes you to Rome’s most beautiful photo spot and helps set the scene of ancient Rome as you admire the Roman Forum from above, all lit up at night. No Crowds! You may not see another tour group the entire time you're in the Colosseum. 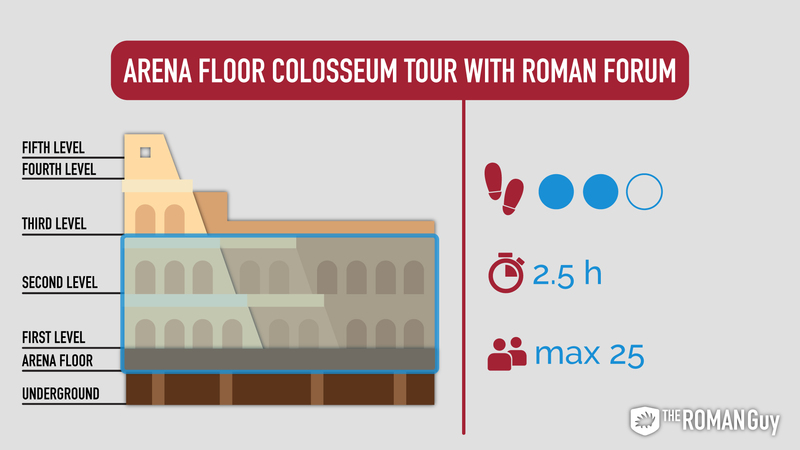 Explore the Colosseum’s Underground, with an expert English-speaking guide. Walk onto to the Arena Floor, where the brutal gladiatorial games took place in ancient Rome. If group tours aren’t your cup of tea, you can still visit the Colosseum on your own. 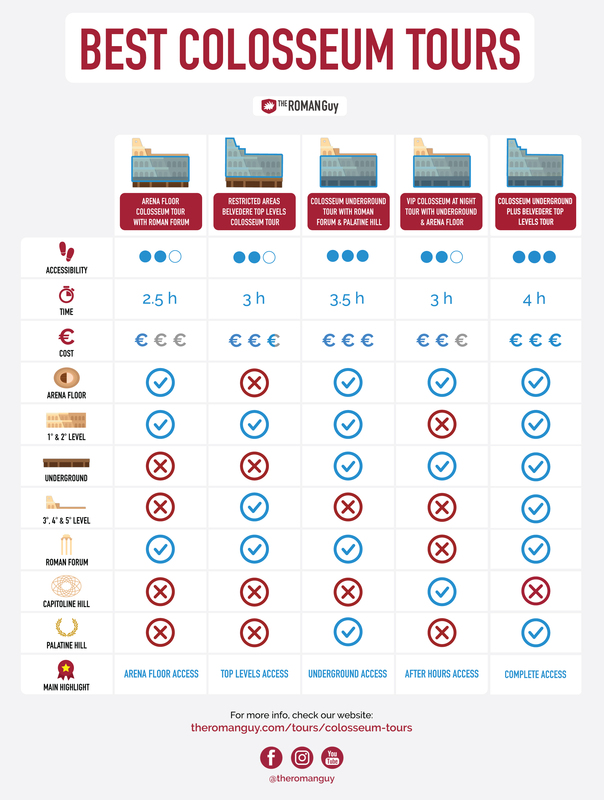 However, there are a few things to keep in mind if you decide to forgo the company of a professional guide. For one thing, it's important to pre-book your Colosseum tickets on the website in advance. If not, you’ll inevitably have to wait in line and avoid the hagglers that will try to sell you tickets on the grounds. If you decide on an impromptu visit and don’t buy in advance, get there around eight in the morning, or a few minutes earlier. That way, you won't spend most of your visit standing in line, but instead where gladiators once stood. Going first thing in the morning is always best. Not only will it be cooler outside, but the crowds of tourists will be much more manageable. Wear comfy shoes! Not only will you walk during the tour, but the ground outside the Colosseum is made of cobblestones and can be slippery/uneven. Keep two eyes open and on your belongings. It’s a crowded area with a lot of people looking for distracted tourists. Water is important. 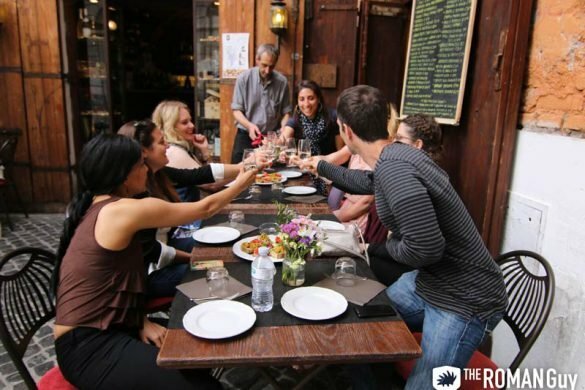 Bring a reusable bottle and fill it up with the wonderful fontanelle around the Colosseum (and the rest of the city). Ciao Glenda! Thanks for reading our blog. 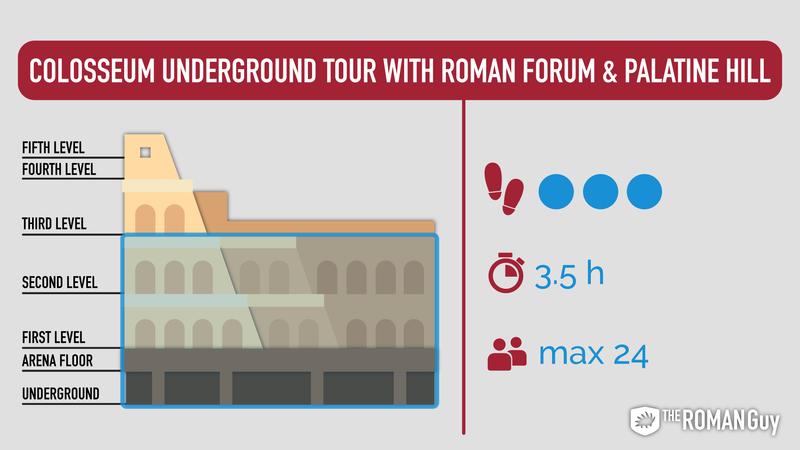 For all of our Colosseum tours, they meet right outside of the Colosseo metro stop. More detailed information can be found upon booking. Hope this helps!